Earlier this month, the American Cancer Society South Atlantic Division co-hosted a half-day conference in Bolivia, entitled "Caminemos Juntos Contra el Cancer” (Walking Together Against Cancer), which brought together more than 250 Bolivian health professionals and community organizations to discuss the latest science and regional developments on cervical cancer prevention. Targeted Population Strategies Manager for Hispanic/Latino and International Initiatives Rosa Villoch-Santiago served as mistress of ceremonies, and Chief Mission Officer Patricia Hoge, RN, PhD, gave a presentation on US developments regarding the HPV vaccine. Society President Elmer E. Huerta, MD, MPH, gave the keynote address, “Preventing Cancer in the 21st Century.” Given his past involvement with Hispanic/Latino health issues, his visit generated tremendous enthusiasm in Bolivia. 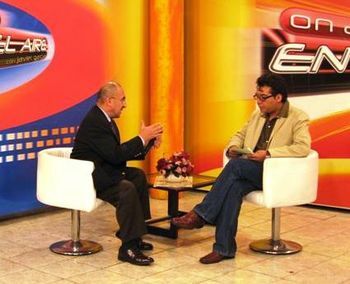 Dr. Huerta met with Bolivia's Minister of Health and conducted numerous interviews on radio and television. The conference marked an important step forward in an ongoing partnership between the Division and the Bolivian Foundation Against Cancer. The Division and its Bolivian colleagues have created an interagency NGO and governmental coalition responsible for initiating the process to create a national cancer plan for Bolivia. 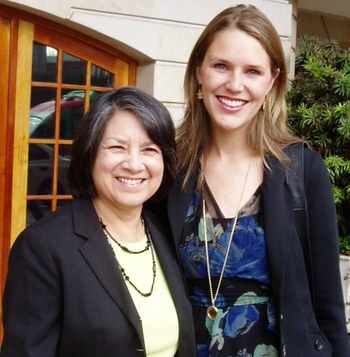 The Division will also host a fellowship program focused on mission delivery and outreach strategies in the spring of 2008 for two health educators from the Bolivian foundation. An American Cancer Society grantee, Fronteras Unidas ProSalud, has been recognized by the Mexican Association of Philanthropy for raising public health awareness in the Mexican state of Baja. Fronteras Unidas ProSalud was named one of the most important nongovernmental organization (NGOs) in the country, representing a significant step in the modernization of medicine in Mexico. 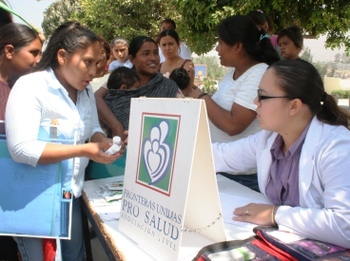 Since 1996, Fronteras Unidas ProSalud has been giving medical care to women who lack access to important health services. The organization works with doctors in Tijuana to provide health services to impoverished young mothers who cannot afford high-quality medical care. The American Cancer Society supports one of these programs – named the Promotora Program – which enables health educators to provide the community with lifesaving messages and vital health services. This program has been largely responsible for educating and disseminating information to the community on cervical cancer and early detection. Additionally, the Promotora Program works within Mexico's schools and workplaces to provide education on family planning, maternal healthcare, and domestic violence. On June 26-27, the Society joined more than 500 cancer patients and leaders of cancer nongovernmental organizations (NGOs) to participate in a Latin American patient forum held in Bogota, Colombia. The forum provided an opportunity for these groups to discuss the importance of volunteerism and how to involve cancer patients in cancer advocacy and community activities. Rose Osborn, a Reach to Recovery® volunteer in the Society’s High Plains Division, and Alison Mitchell of the Society’s International Affairs department shared their cancer experiences. Cristina Parsons Perez, the Society’s manager of Latin America initiatives, delivered a presentation on volunteerism and the role of civil society in the fight against cancer. The forum was sponsored by Vivir, Colombia Saludable, and Roche Colombia. Thirteen global civil society and public health organizations have launched the Global Call to Stop Cervical Cancer – a disease that kills more than a quarter of a million women each year. This Global Call aims to mobilize political support to ensure that every woman and girl has access to newly available lifesaving vaccines and new screening and treatment tools. Members of the strategic advisory committee for the Global Call to Stop Cervical Cancer include The World YWCA, The Rockefeller Foundation, PATH, The International Planned Parenthood Federation (IPPF), The International Federation of Gynecology and Obstetrics (FIGO), Family Care International, JHPIEGO, American Cancer Society, The AIDS Vaccine Advocacy Coalition (AVAC), The International AIDS Vaccine Initiative (IAVI), the Medical Women’s International Association (MWIA), the International Union Against Cancer (UICC), and Sociedad Latinoamericana y del Caribe de Oncologia Medica (SLACOM). The Global Call is supported by funding from the Rockefeller Foundation and PATH. Global Health Strategies, New York, is the secretariat for this effort. In 2007, the American Cancer Society helped the Chinese Anti-Cancer Association establish the Chinese Psycho Oncology Society (CPOS). This year, the Society proudly co-hosted the first Psycho Oncology Training on July 11-13 in Huangshan, China. More than 60 passionate oncologists from 40 cancer hospitals across China attended this groundbreaking training, in which discussion topics included depression, social support, quality of life, pain management, psychological nursing care, and hospice. Feedback indicates that topics covered in this two-day event significantly increased participants’ understanding of how to better serve their cancer patients and that much more training is needed in China. All participants expressed their gratitude to the American Cancer Society for its support of the advancement of China's psycho oncology movement. In April 2007, the American Cancer Society met with leading cancer NGOs in Brazil as part of the Latin America Regional Health Grants Program, which supports cancer early detection projects and increases the effectiveness of the Brazil’s cancer NGOs. The Brazilian Cancer Association (ABCancer), the Breast Institute (IMAMA), and the Brazilian Association of Lymphoma and Leukemia (ABRALE) hosted Alessandra Durstine, director of the Society’s Latin America Programs, and Cristina Parsons Perez, manager of the Society’s Latin America cancer initiatives, to evaluate proposals for cancer early detection projects and participation in the Program. The Latin America Regional Health Grants Program is a three-year grant by the Pfizer Foundation to help build cancer-fighting programs in Argentina, Brazil, Colombia, Costa Rica, Mexico, and Venezuela. Domenico Melillo, MD, of the Asociación Nacional Contra el Cáncer (ANCEC) and Natalia Frias, MD, of the Dominican League Against Cancer recently completed fellowships at the Pennsylvania Division. Drs. Melillo and Frias, who both organize cervical cancer educational campaigns and outreach to rural communities, were invited to participate in the Breast and Cervical Cancer Conference for Pennsylvania. This enabled them to meet many volunteers, physicians, and cancer researchers. They also had an opportunity to meet Division board members and experience firsthand how the Pennsylvania Division conducts outreach in the state’s Latino/Hispanic community. Drs. Melillo and Frias also had an informative exchange with Division staff, including Spanish-speaking cancer information specialists who provide cancer information and assistance. Other highlights included attending a fundraising reception in Williamsport for the American Cancer Society Action Network (ACS CAN). 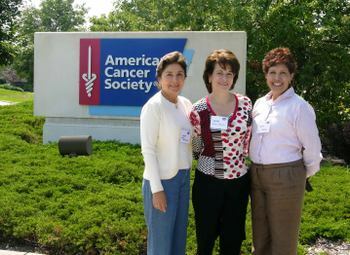 In April 2007, International Affairs staff and Rosa Villoch-Santiago, strategies manager for the Hispanic and Latino Community for the Society’s South Atlantic Division, participated in the second annual American Cancer Society Disparities Conference in New Orleans, Louisiana. 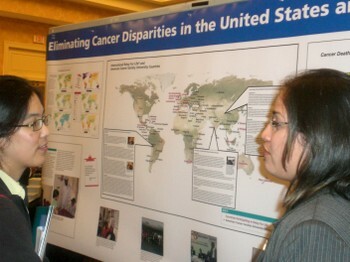 Staff interacted with hundreds of visitors at a poster booth exhibit entitled “Eliminating Cancer Disparities in the United States and Abroad.” This exhibit highlighted some of the Society’s efforts to reduce disparities through community-based projects in Bolivia, China, India, and in more than 100 countries involved in the International Relay For Life® and American Cancer Society University programs. Conference attendees learned how Society programs abroad increase global cancer awareness and patient services, as well as strengthen the Society’s ability to serve ethnic constituents in the United States. The Reverend Jesse Jackson, Jr., served as the keynote speaker at the conference.